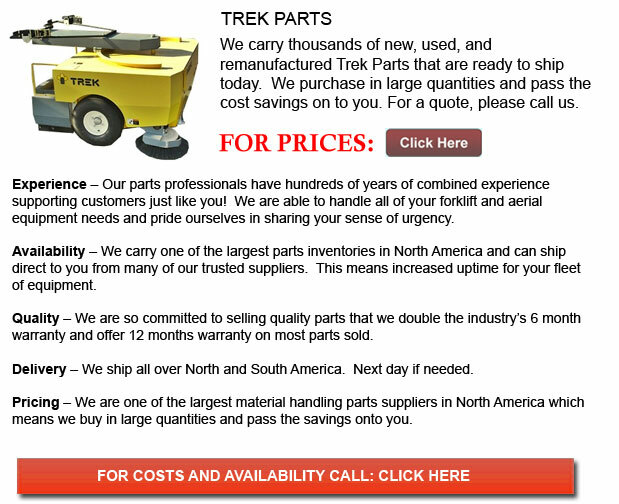 Trek Parts - TREK Cleaning Machines is a machine maker who is passionate about the cleaning trade. The company's founders, Bob O'Hara, Jim Hartsock and Chris Knwolton, have more than 60 years combined experience with successfully designing, developing, marketing, manufacturing and offering customer support. The company's cutting edge flair is a reflection of the entrepreneurial style of the founders. They really believe in delivering true value to their clients and are devoted to providing top quality and new design concepts in order to meet the diverse needs of their clients. TREK Cleaning Machines always provides fresh design concepts as shown in their product development. They enjoy offering products which energize both their partners and their dealers and offer production gains to their clients. The TREK team of workers enjoys new tasks and new challenges. They are really proud to launch its breakthrough technology found in their Torsion scrubber line. This particular line was motivated by the comprehension of operators' needs and skills combined with their knowledge of cleaning applications, together with owners' strong desire to considerably lessen expense through productivity gains. When considered necessary, the employees within TREK and its many dealer members in both parts and in technical support will be obtainable. Amongst their core values is their high service commitment in their customer service. Keeping their clients' cleaning machines ready and running on a daily basis is top priority. The company's top of the line technology delivers reliable machine that eventually lessens your cost of cleaning. The service, the product and the price all work together to make them the leader in the industry.